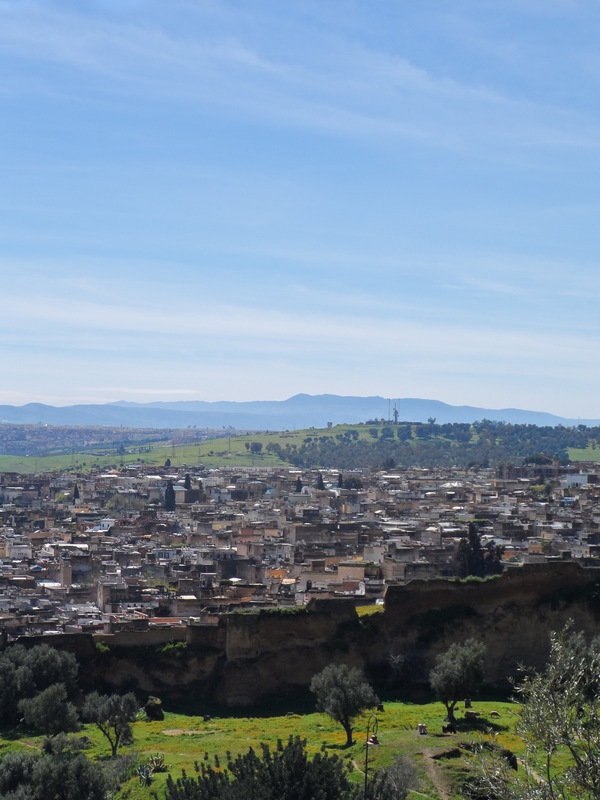 The old city of Fez can be very overwhelming and crowded (we were constantly getting touched and grabbed by strangers), so on our third day we left the city center and headed for the Merenid Tombs. 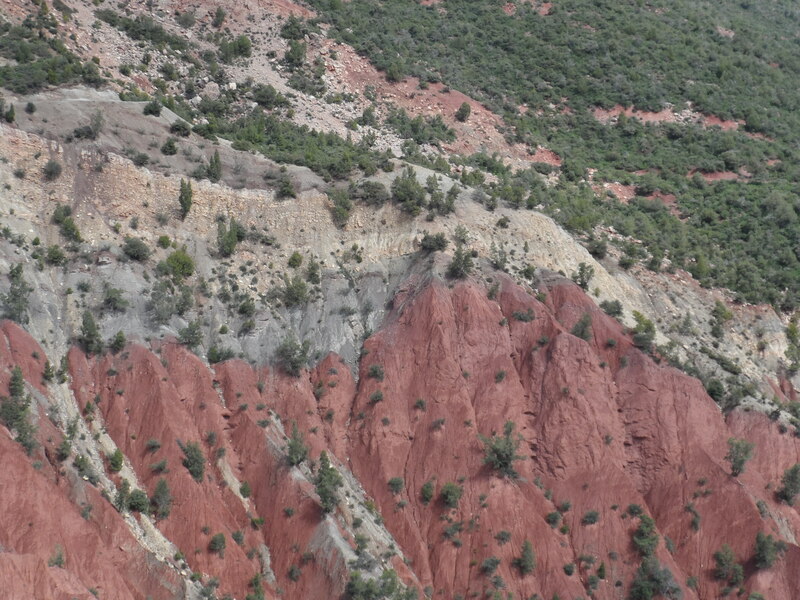 This was only a twenty minute walk from our hotel, but it felt like a different world. 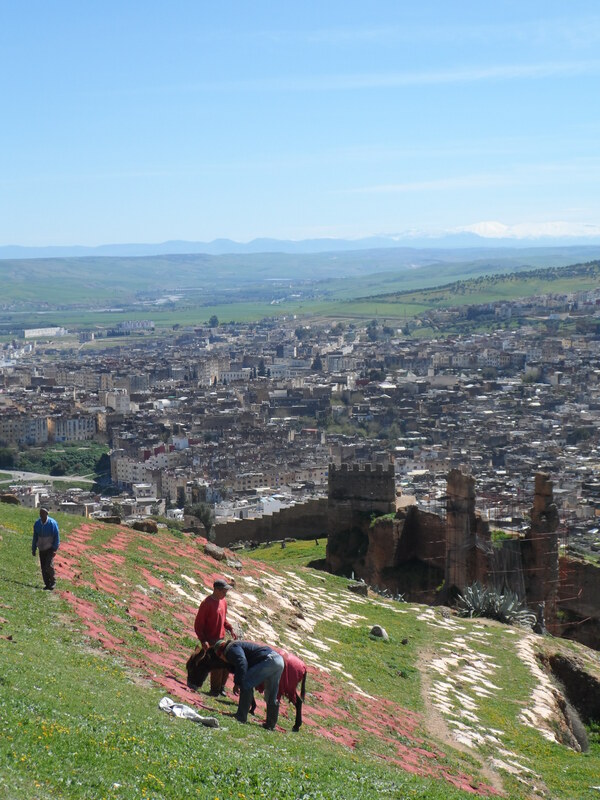 If you visit Fez, don’t miss the opportunity to pack a picnic and spend a day in the hills. 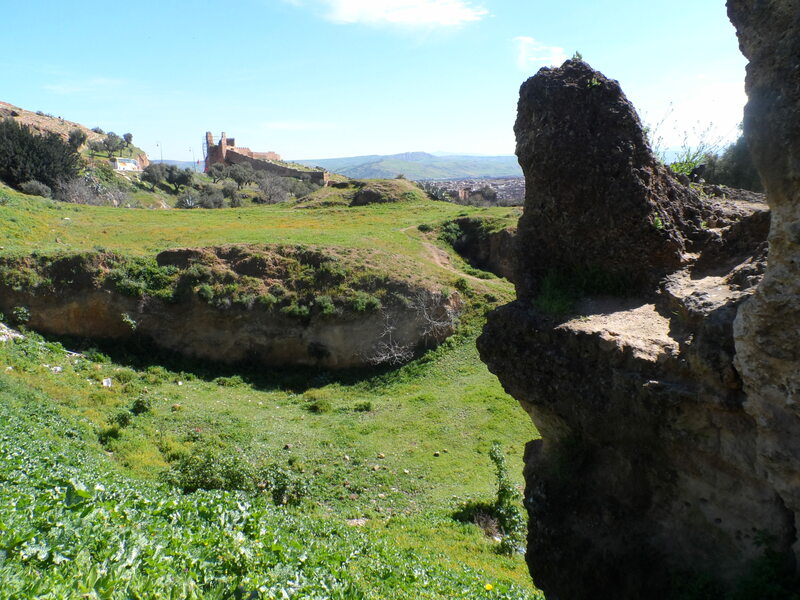 If you’re not physically active, you can also get a taxi to drive you to the top of the hill for about $10. 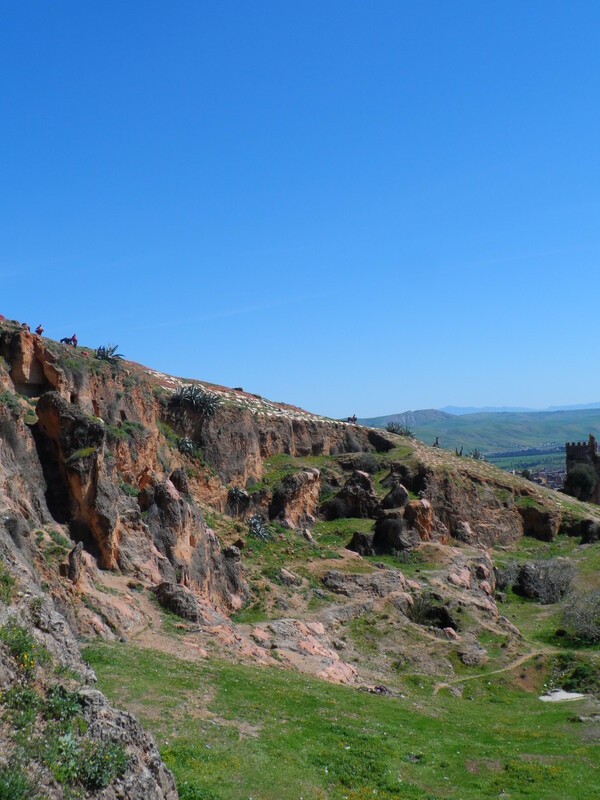 You can’t help but sing “The Sound of Music” when you walk these hills… at least I couldn’t. 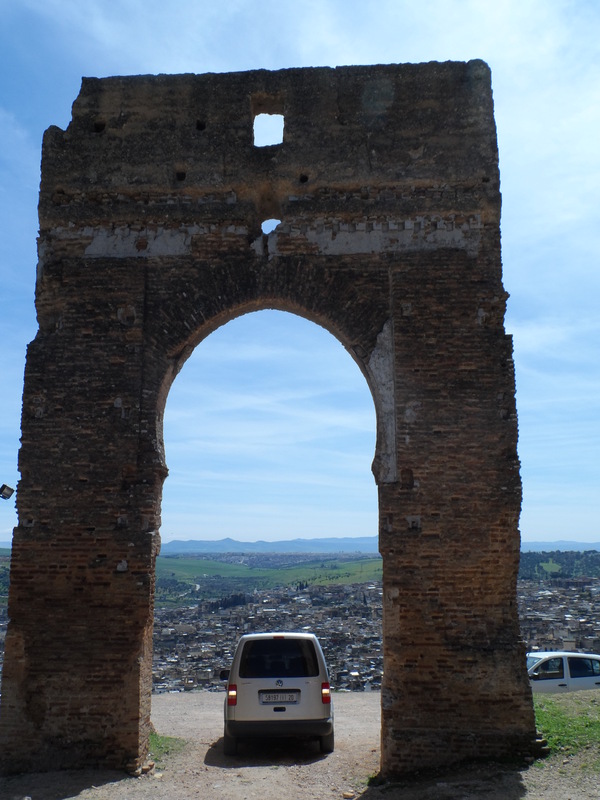 You can see all of Fez from these ruins. Every family has a specific plot of land where they can dry their leather hides. 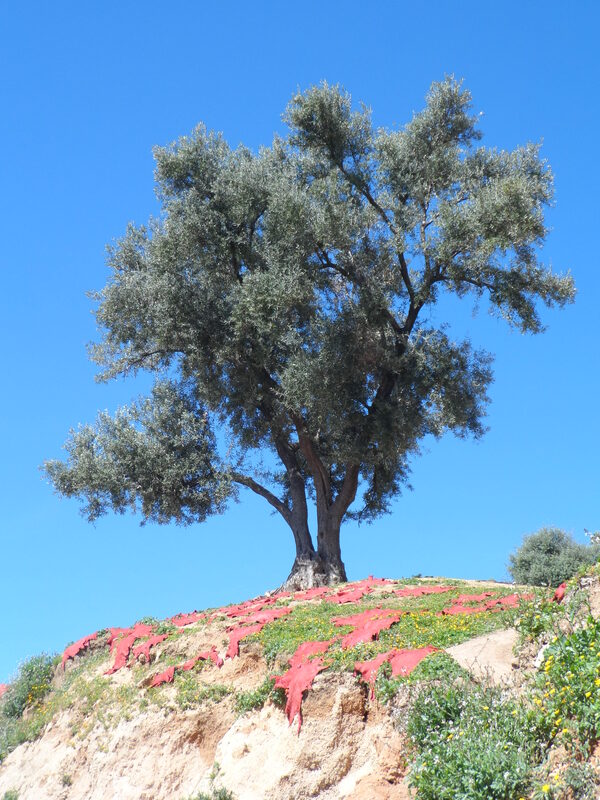 Can you see the leather on the top of the hill? Here’s a family collecting their leather. It’s hard to believe my buttery leather coat was once just a stiff piece of skin drying in the sun. 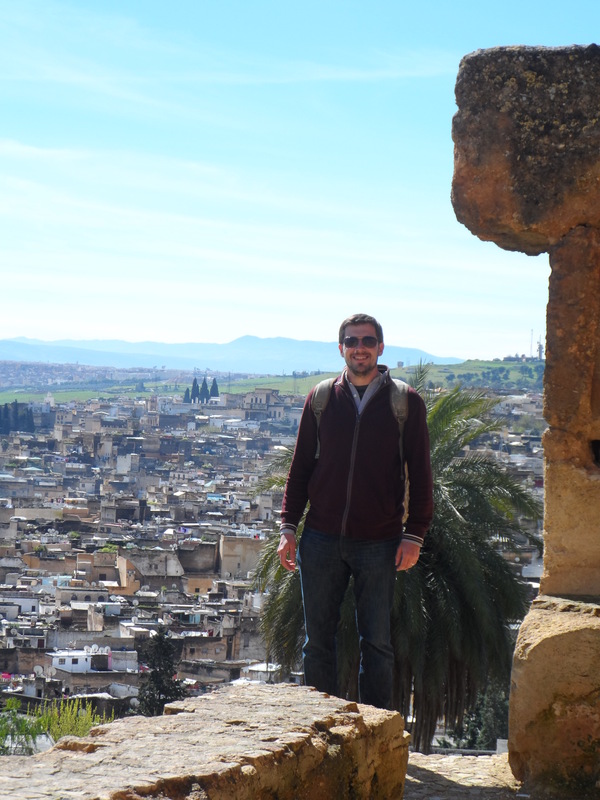 Fez isn’t as overwhelming from this perspective. 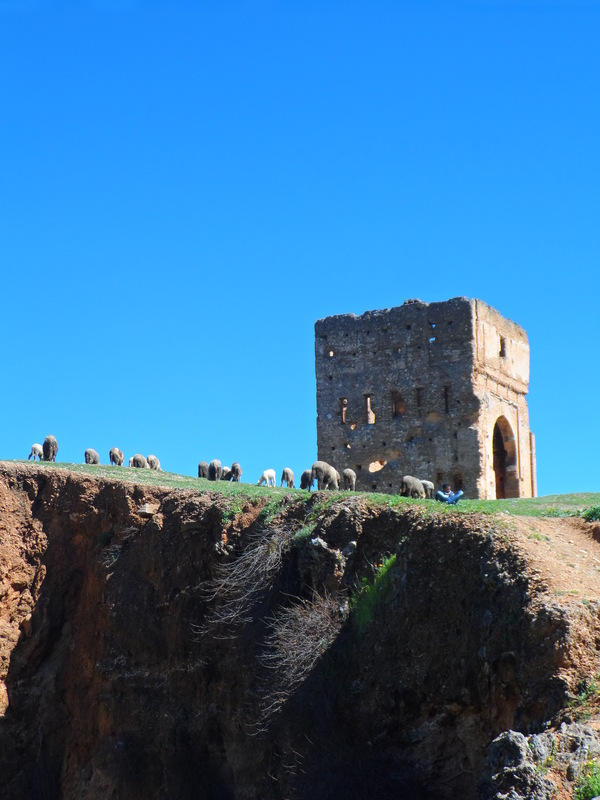 Amidst the 14th century ruins, sheep and goats graze. 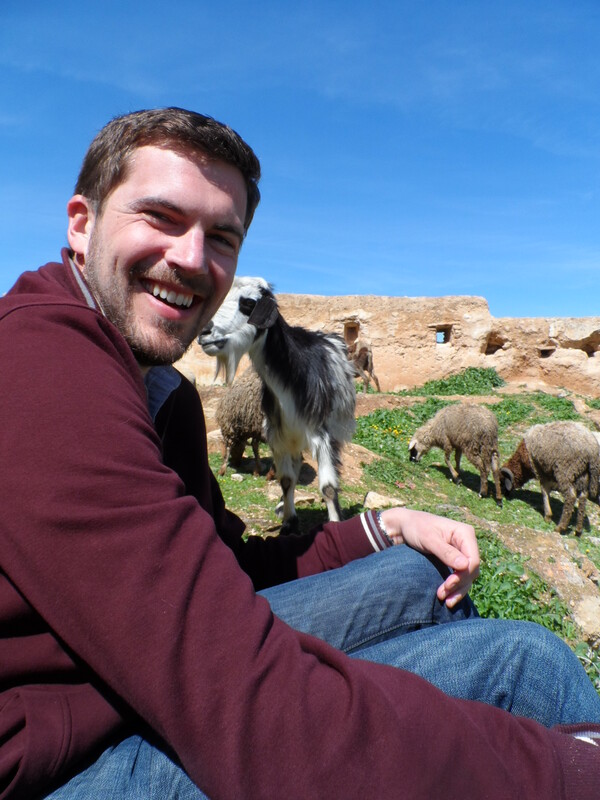 One of the goats wanted to join our picnic. The world’s oldest parking spot. 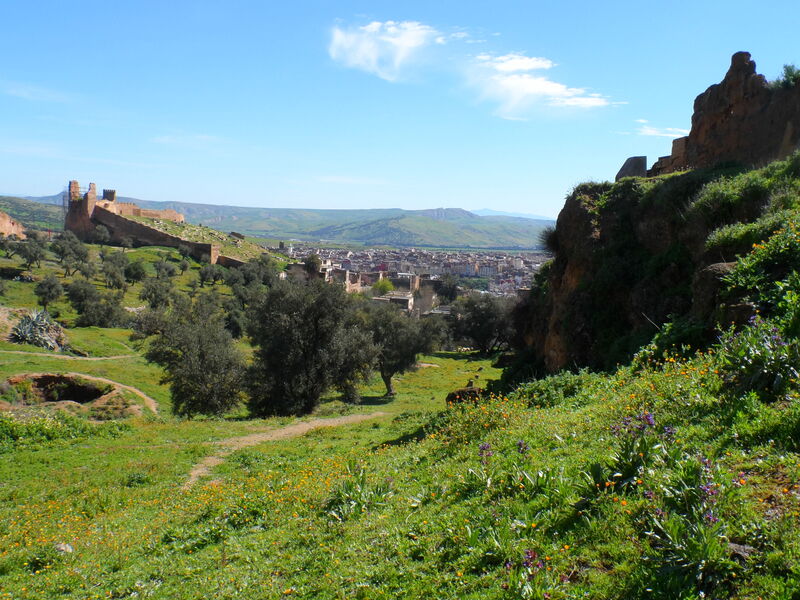 Posted in adventure, Morocco, photography, travel and tagged best picnic spots, Fes, fez, honeymoon, merenid tombs, Morocco, Travel and Tourism on April 4, 2013 by Tracy. 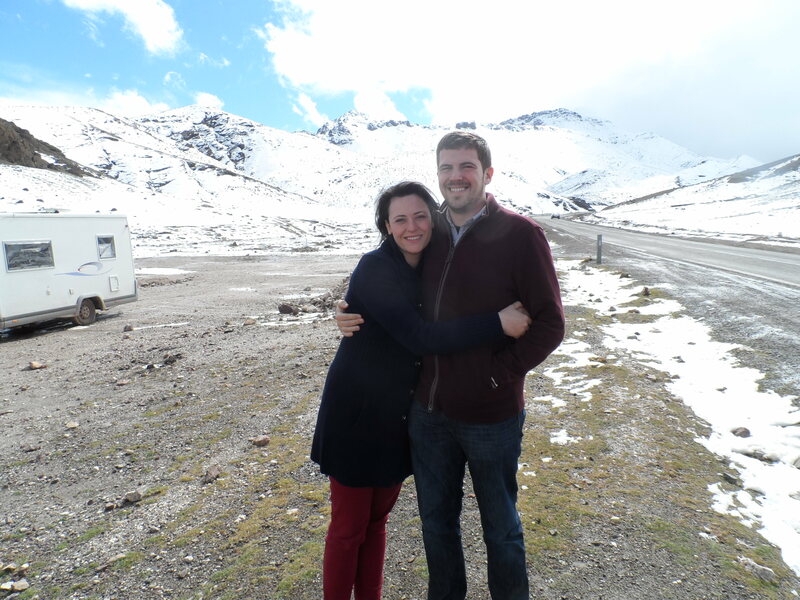 But we wanted an adventure so we dismissed her fears and eagerly awaited the rental car representative. Corinne came with us to inspect the car, since the rep only spoke French. Just as I got in the front seat and was about to sign the rental agreement she pointed to the stick shift and said she was surprised I knew how to drive one. Ahem. 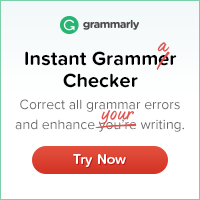 I don’t. And neither does Mike! Thank god we got a driver because the road was insane. 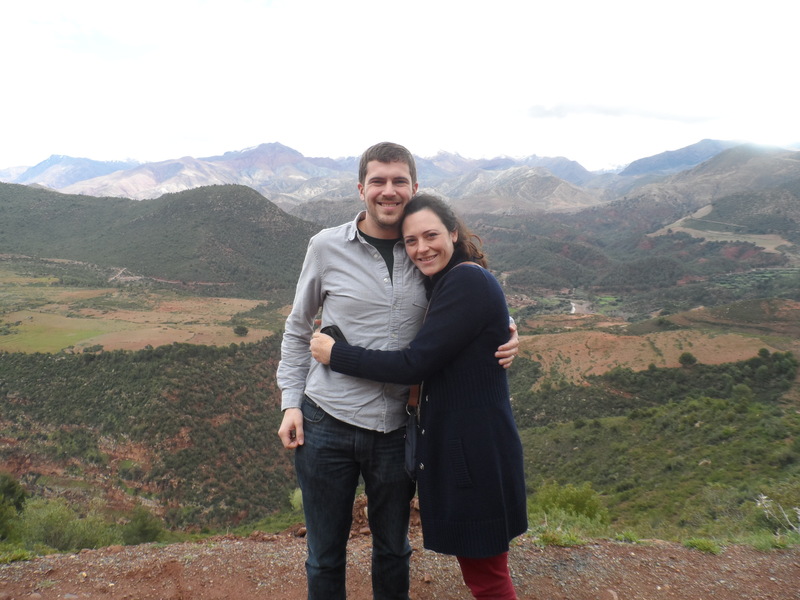 On the first day, we drove a distance of about 60 miles, but since there were so many switchbacks, it took over four hours. Every time we made a sharp turn (which is every minute) it looked like our back wheel was going over the edge and all I could see was a 1000 foot drop below me. Also it’s impossible to know what’s a restaurant along the main stretch, or how far apart the gas stations are, so for this country I would definitely recommend a driver. Also we had someone to take pictures of us! I can’t believe this isn’t a painting. One of the many farmer’s villages. I didn’t realize we would be driving through that snowy mountain range in the distance. 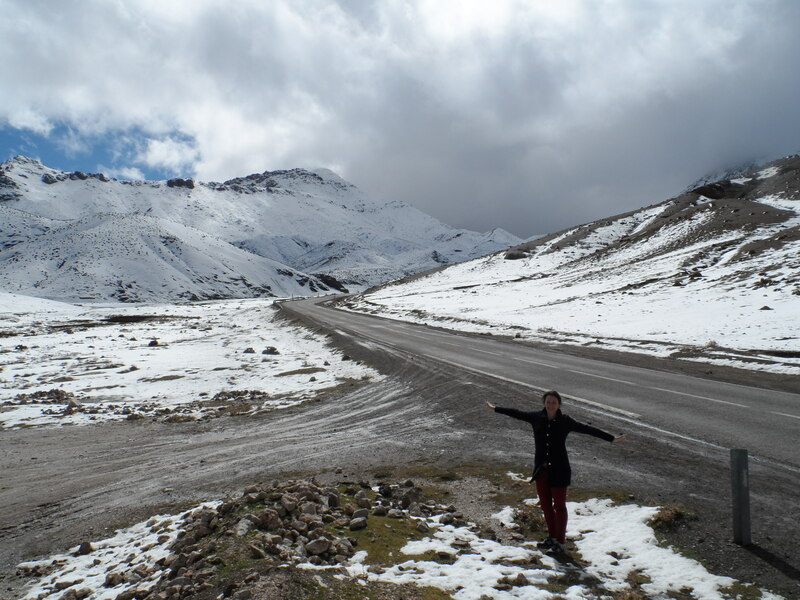 Who knew there is much snow in Morocco! 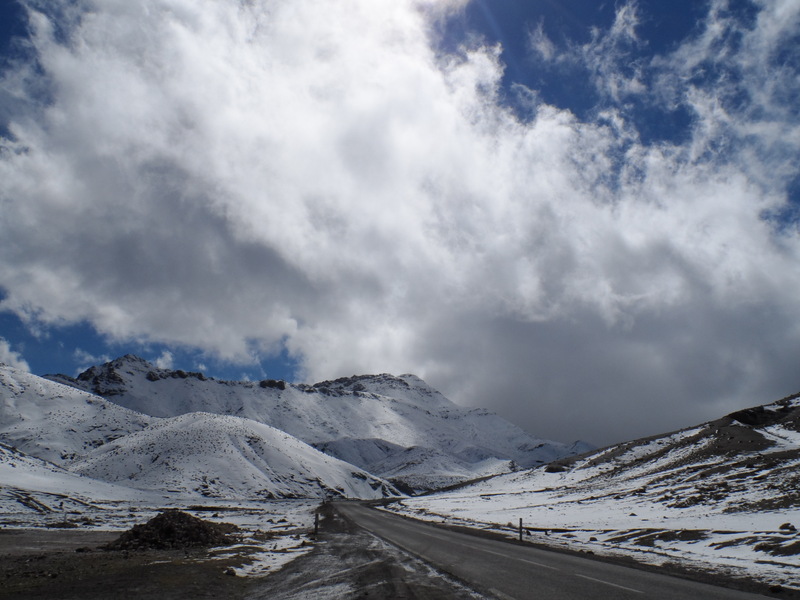 We were driving through endless fields of rocks, and suddenly it all turned white. 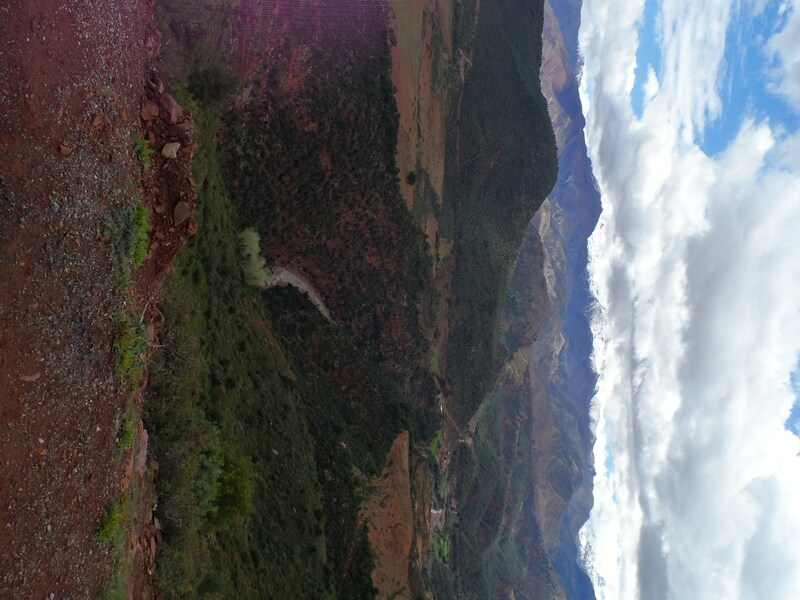 Here we’re passing through the highest pass of the Atlas Mountains. 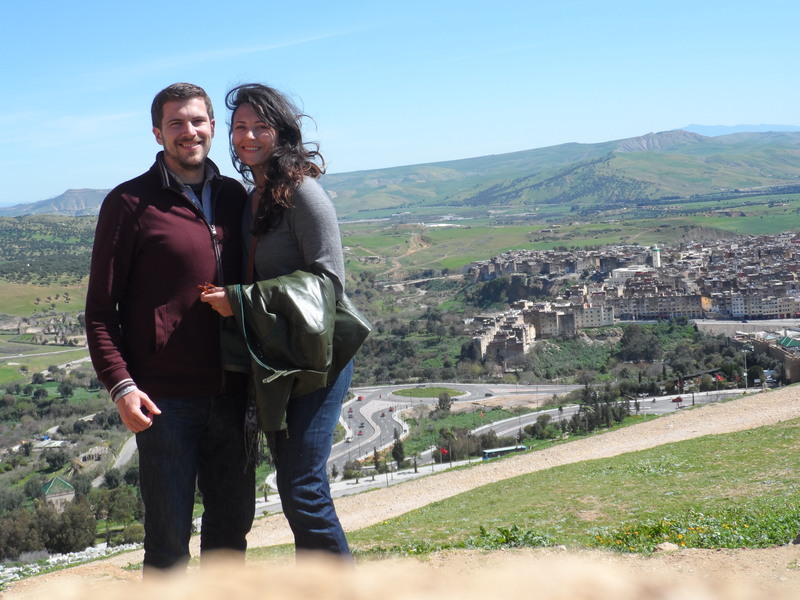 I’m back from my honeymoon in Morocco and tanner than ever! I will post some stories about our wedding as soon as I get the official pictures from our photographer, but in the meantime, I’ll let you in on some of the amazing adventures from our honeymoon. As custom, they served us with mint tea as soon as we arrived at our hotel. She first poured one glass and put that aside. Then she poured two more glasses and threw those out because supposedly they’re too bitter. Then she poured the original glass back into the pot and added that entire pile of mint. 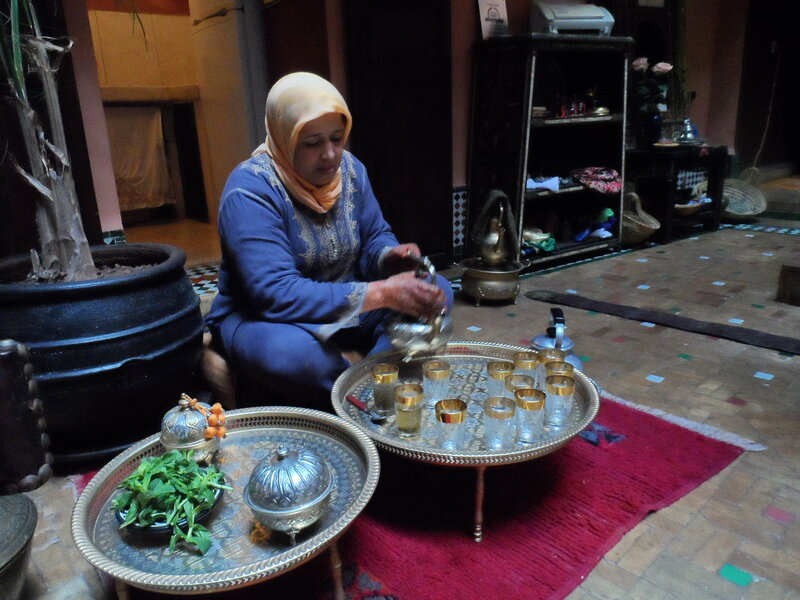 We had A LOT of mint tea in Morocco, but that was definitely the finest. 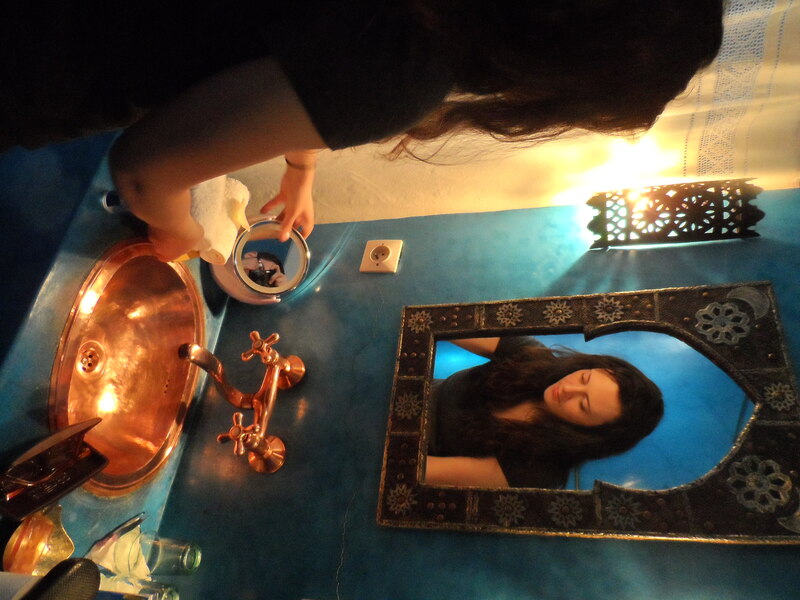 I was obsessed with the copper sink in our bathroom and the deep blue walls. Our hotel was a perfect introduction to Moroccan aesthetics. 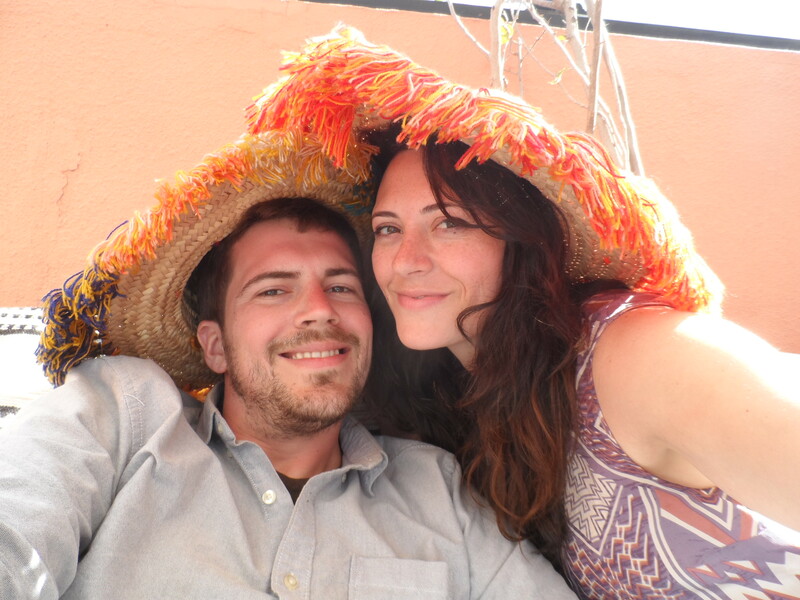 We even had our own terrace, complete with matching sombreros. We could have spent the whole day in our serene suite, but there was an old Medina (an ancient walled in city) to explore. 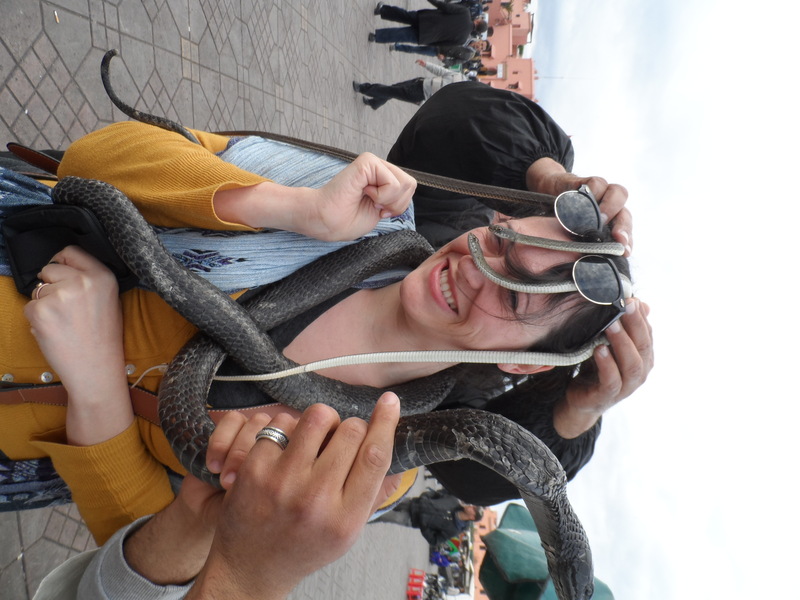 In the main square, we were immediately attacked by snake charmers who draped all their nasty snakes all over us. We had to pay them just to get the snakes off of us. YUCK! I could even see a mouse shaped lump in one of them. 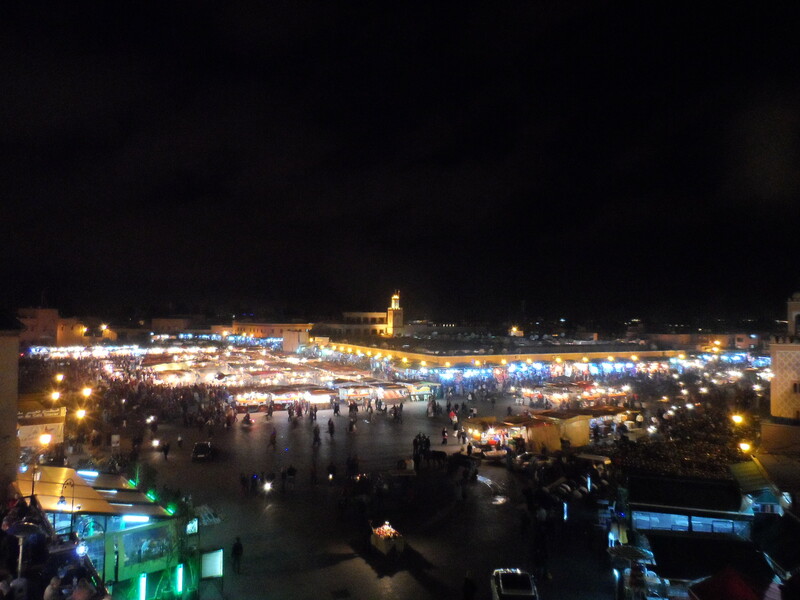 The market place, known as a Souk, was crowded and intense. Don’t be surprised to see half a butchered cow hanging next to necklaces and scarves. You can find anything you need within arm’s reach. 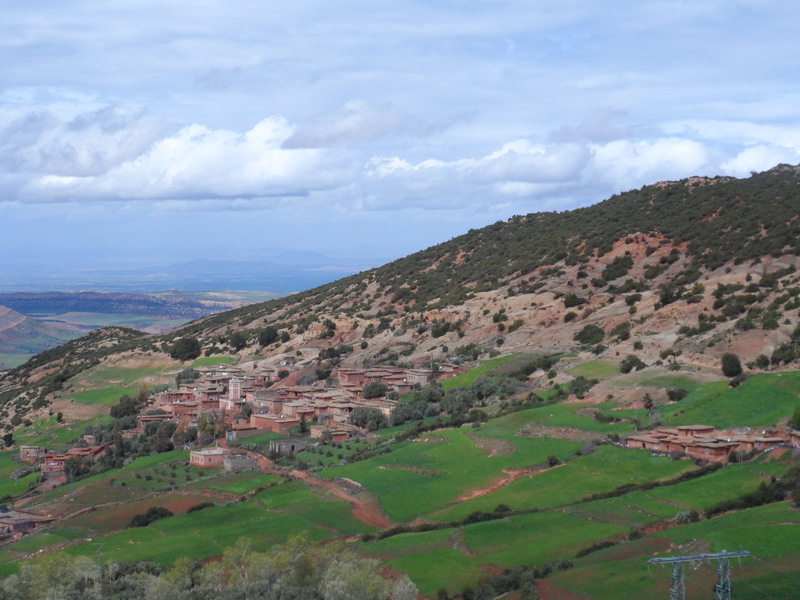 Morocco’s really a place to go if you love shopping, but you need to be comfortable bargaining. I never paid more that an eighth of the original price they gave me. Our tour book said they hike the prices up the highest for American and Japanese tourists. The main square was filled with snail soup kiosks. The smell is intoxicating. We had a small bowl before dinner. I’ve never had snails before, and it was a little hard to get past their little faces, but I got over that pretty quickly because they were so delicious. 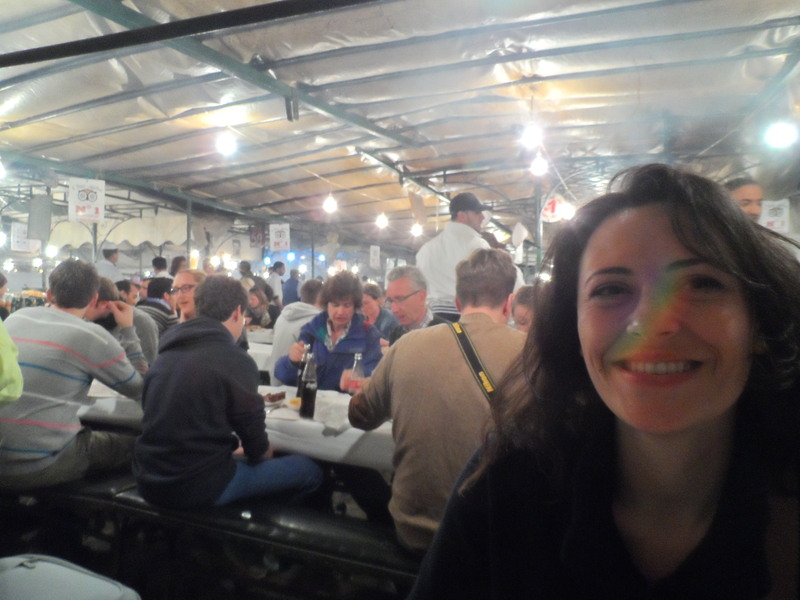 Next, we had dinner in the middle of the square. I’ve never had a dining experience quite like this. It’s a maze of little bbq stands and the waiters will actually block you so you can’t go past them when choosing which one to go to. They will put the menus right in front of your face, or grab your arm. Then if you say no, they curse you out. We went through the stands twice before we couldn’t handle the harassment any further and sat down in the closest empty seat. 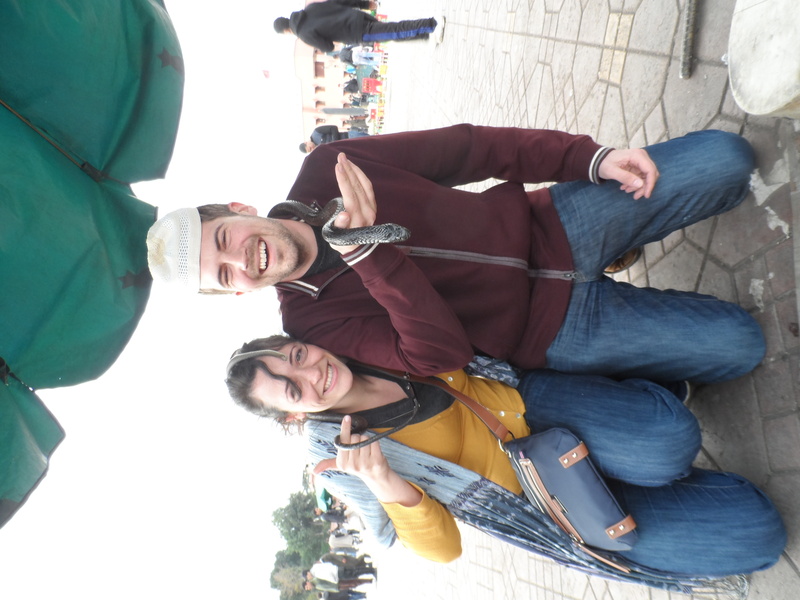 We had tajines (meat and vegetables cooked in a traditional clay pot), coke and olives, for a grand total of $4. 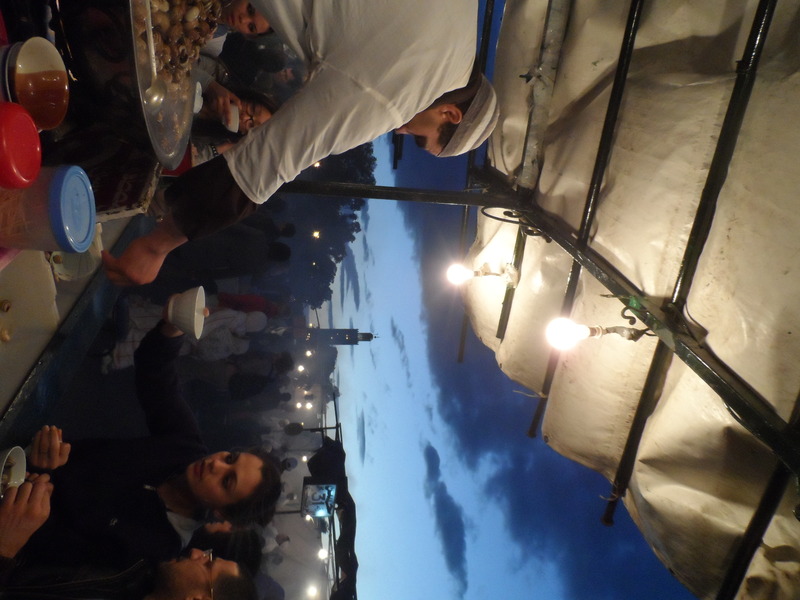 Marrakesh doesn’t really come alive until after sun set. There are tons of street performers, snake charmers, henna artists, and trained monkeys. 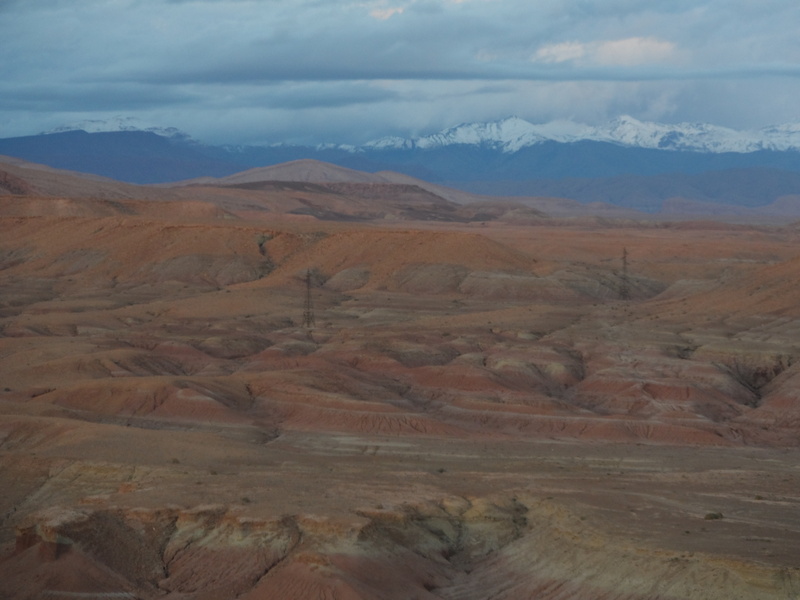 It can be a little overwhelming to be in the middle of it, but it’s really entertaining to watch it all from a terrace view (while drinking mint tea). 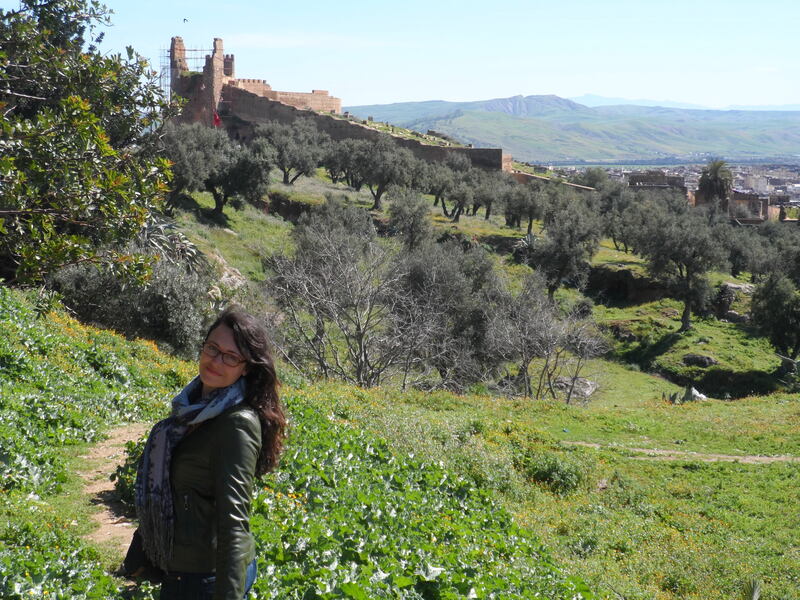 If you visit Marrakesh make sure to stay in the old medina. 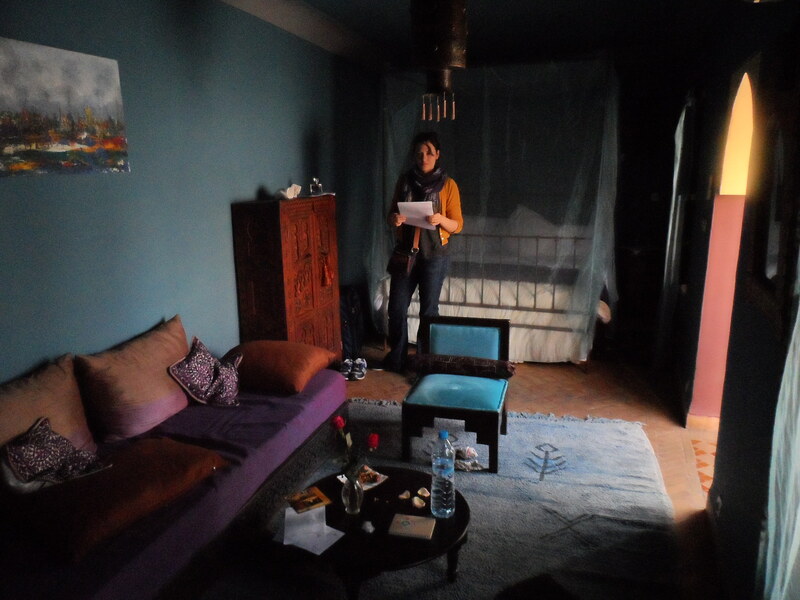 I loved our hotel, Riad Ajebel, and the owner was incredible (more about her in the next post). The walls of our hotel were built in the 11th century! 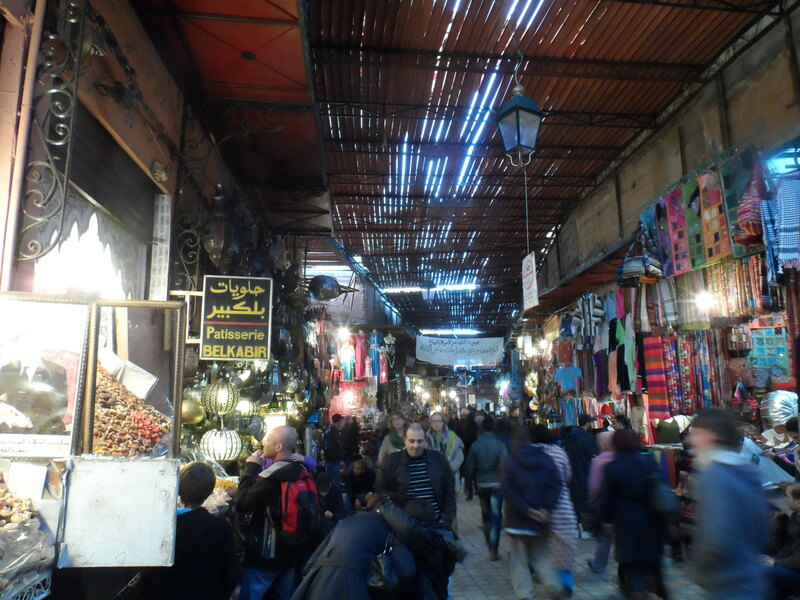 Marrakesh was like a living museum. We spent three nights here (we traveled during the day), but that was definitely a good taste.